This is a job I've been meaning to do for some time. 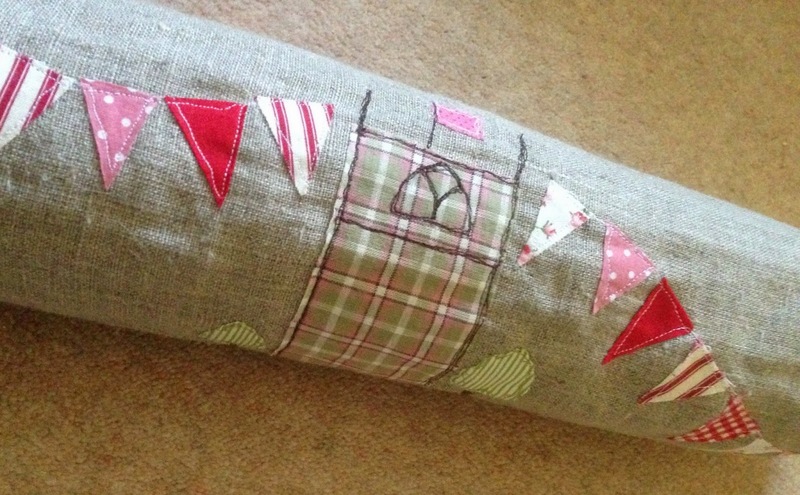 We needed a draft excluder to replace the rolled up old mat which was trying to do the job but not doing it very well. I wanted a design which was easy to do but had a personal touch. What I ended up doing was choosing two well known local buildings (the church and almshouses) and getting himself to make a very simplified line drawing of each of them. I used bondaweb and drew all the pieces I wanted to cut out on the non sticky side and ironed them onto the fabrics I'd chosen. 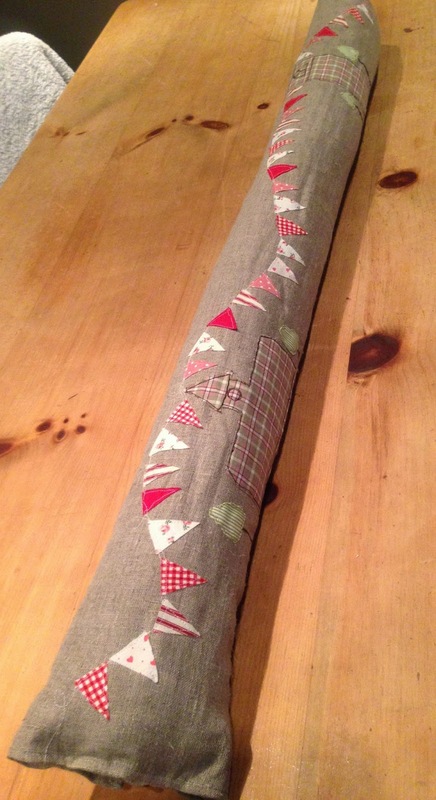 Luckily I am a fabric hoarder and had plenty of scrap pieces to choose from. Our house is somewhere between shabby and chic so I opted for a neutral linen background with some bright reds and creams with a dash of green to whoop it up a bit. 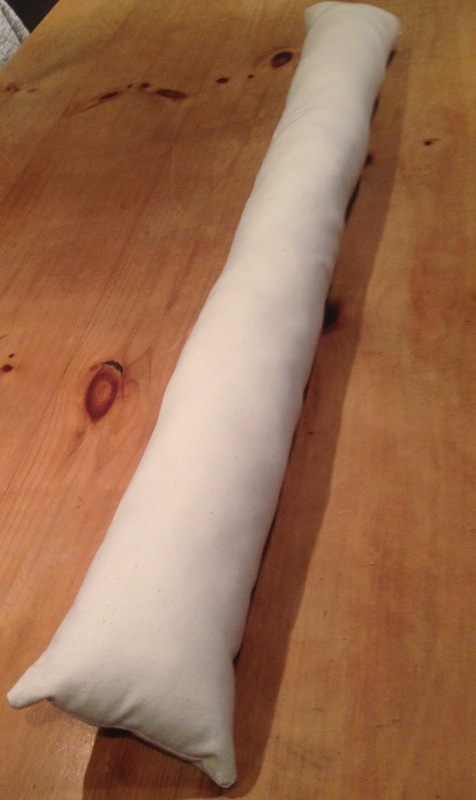 Here's the basic sausage. To fit our front door it's 40 inches long and about 11 inches round. This is the fun part, the fiddling about with where to put things. Final positions decided and ready to be ironed into place and then whizzed under the sewing machine. Ta dah! This is a close up of the finished cover all fitted and with machine embroidered detail added. Detail of the almshouses with it's little clock represented by a circle. And here's the cake. A Victoria sponge filled with butter cream icing and strawberry jam hand spooned from a jar. Always a winner! 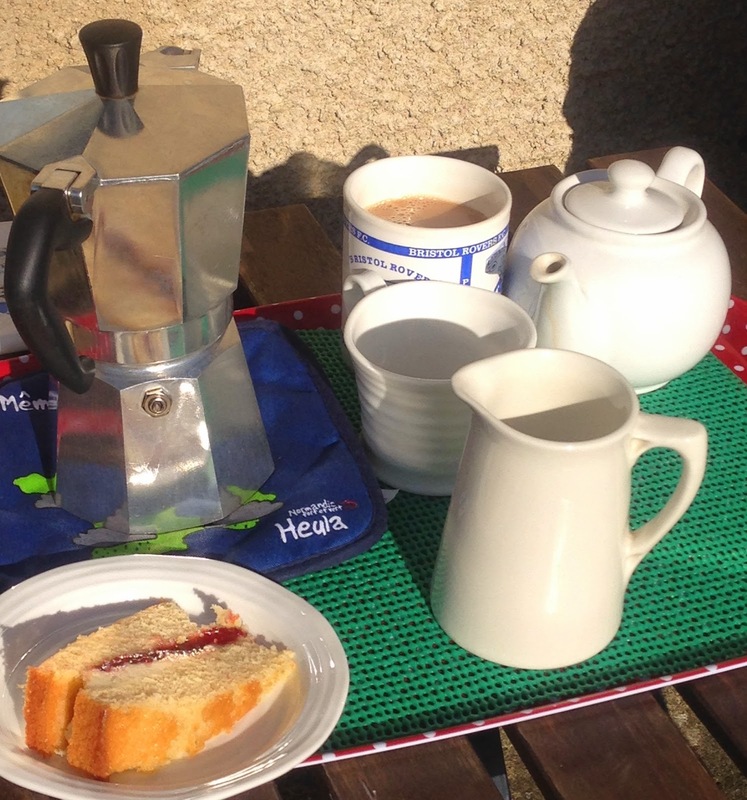 This morning's weather was fabulous for early February so we took full advantage of it and sat outside for the first time this year in glorious warm sunshine to enjoy my coffee and his tea, with cake of course.